Description: Wingspan 42-48mm. 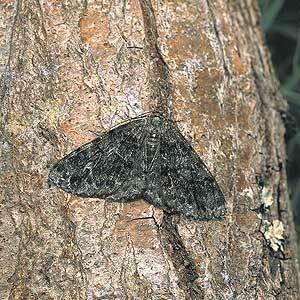 Adults are usually a darkish brown and the forewings have a slight mottled appearance. Similar Species: This species closely resembles the Mottled Beauty A. repandata and individuals should be examined carefully to confirm identification. Requires careful examination to confirm identification. Flight Period: Adults have been recorded from the end of June to mid-August. Status: Local, recorded mainly in the southeast. This species was previously unknown in N. Ireland until 1999, when it was discovered at Rostrevor Oakwood NNR during a moth workshop. Since its initial discovery it has been recorded from several other localities mainly in Down, at Bohill NNR, Castlewellan and Belvoir Forest Park. Recent colonies have also been found at Rehaghy, Tyrone and Brookeborough, Fermanagh. Its recent discoveries in other well-known localities would indicate that its presence is more widespread than previously thought and that it has been overlooked. Ecology: A scarce woodland species found mainly in old plantation woodland. Adults are attracted to light in small numbers and may occasionally be found during the day by beating the foliage of the foodplants. Its resemblance to the Mottled Beauty may have hindered its discovery especially at well-trapped localities such as Rehaghy and Belvoir. It is scarce elsewhere in Ireland and only known from counties Kildare, Wicklow and Leix. The larvae are to be found from late August to the May of the following year on Yew Taxus baccata, spruce Picea spp. and Douglas Fir Psudotsuga mensziesii. It overwinters as a larva. World Distribution: Throughout central Europe, Russia and Japan.